Police commanders accuse Amona protesters of unnecessary violence, synagogue desecration. Brig. Gen. Yoram Sofer, the deputy commander of Shai District Police, who commanded the inner circle of police forces who carried out the eviction of the residents of Amona from their homes, spoke about the preparations the police undertook for the evacuation. "We prepared for four months. The preparations lasted as long as [the preparations] for the disengagement. We had mental and physical preparation. We have been working on techniques and sensitivity, where it is possible to release pressure and where pressure must be raised," Gen. Sofer said in an interview with Channel 10. "Anyone who paid attention to our conduct understands that we do not have a beef with anyone. We perform the task the political leadership [sets out for us]. There was no need for the vandalism [in the synagogue of Amona]. This assault [on the police] is very serious," he said. For about an hour and a half, security forces worked to dismantle the barricades activists had set up around the synagogue which prevented the police from entering the building. When the synagogue was emptied, police found graffiti on the walls comparing the security forces to Nazis, including swastikas. They also found holy books lying in the mud on the floor. The police did not say whether the books fell during the scuffle with protesters inside the synagogue. Commander Yuval Shlomo, the border police officer who commanded the eviction, told Channel 2: "We knew we were going to face opposition, but not at this level. We came [having prepared] a variety of scenarios, but this scenario we did not expect. But we knew what to do [in that situation] and how to shield the police officers according to the [level of the] threats properly as we worked "
He said that the police had deliberately left the synagogue for last during the evacuation because of the site's sensitivity. Binyamin Regional Council head Avi Roeh addressed the eviction of the entire community of Amona on his Facebook page. 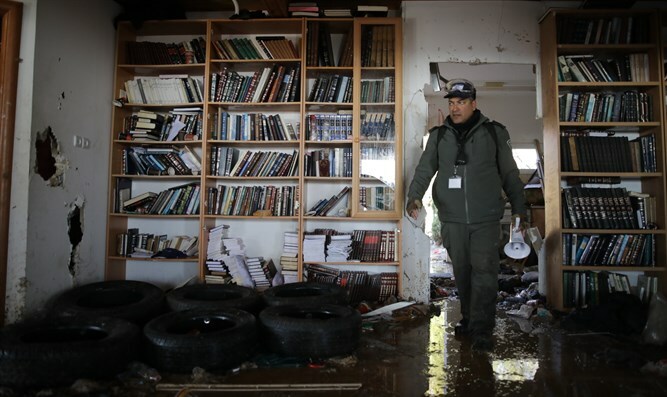 "We saw difficult sights today during the evacuation of the synagogue in Amona, a difficult evacuation which should not overshadow the rest of the evacuation of Amona. Except for a few isolated incidents, the evacuation was conducted with restraint, cooperation, patience, and respect for the those doing the evacuating and those being evacuated, which led to there only being a small number of injuries," Roeh wrote. "We conclude this sad and unnecessary evacuation of the town. The evacuation could have been prevented and we must figure out how to avoid similar situations in the future. The staff of the Council fully supported the residents," he added. "Next week we expect another devastating demolition of houses in Ofra."